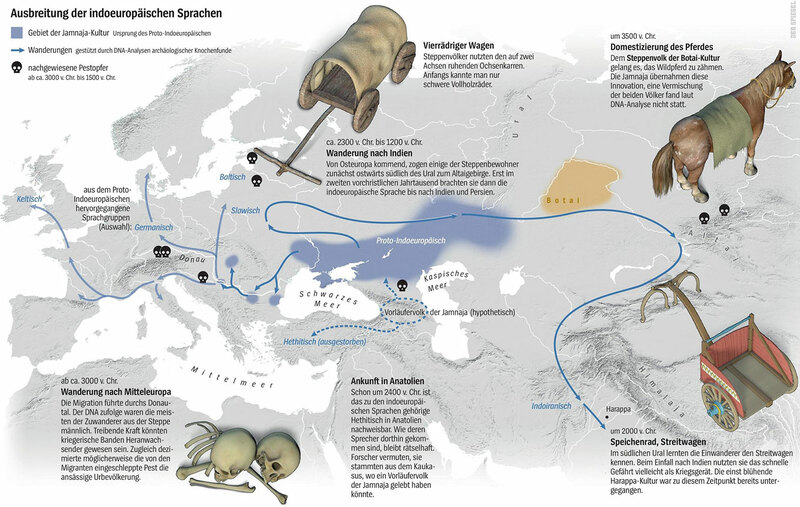 About two months ago I stumbled upon a gem in archaeological studies related to Proto-Indo-Europeans, the book О скипетрах, о лошадях, о войне: этюды в защиту миграционной концепции М.Гимбутас (On sceptres, on horses, on war: Studies in defence of M. Gimbutas’ migration concepts), 2007, by V. A. Dergachev, from the Institute of Cultural Heritage of the Moldavian Republic. 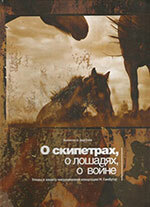 Dergachev’s work dedicates 488 pages to a very specific Final Neolithic-Eneolithic period in the Pontic-Caspian steppe, and the most relevant parts of the book concern the nature and expansion of horses and horse domestication, horse-head scepters, and other horse-related symbology – arguably the most relevant cultural signs associated with Proto-Indo-European speakers in this period. I haven’t had enough time to read the whole book, but I have read with interest certain important chapters. 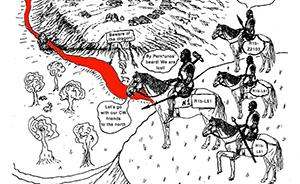 The genetic and chronological relationship of horse-head pommel-scepters is classified with incredible detail, to the extent that one could divide subregions among those cultures using them. 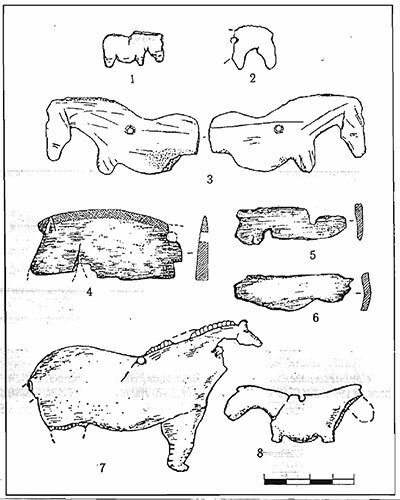 Scheme of regional distribution – chronological – typological development of the carved horse-head stone scepters. The [horse-head pommel-]scepters arose originally in the depth of the Khvalynsk culture. Following the now well-known finds, they are definitely related to those of the Middle Volga group. 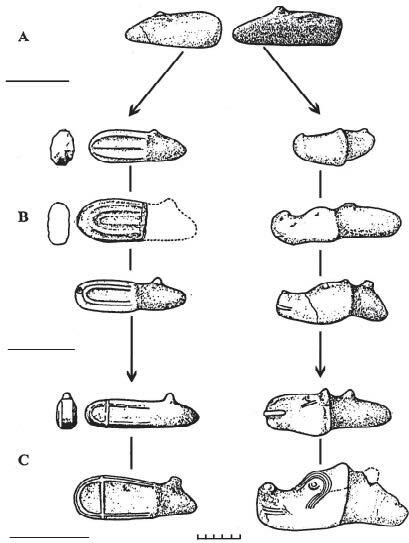 General scheme of genetic and chronological development of carved scepters by visual assessment of morphological details. In their next modifications, these scepters continued to evolve and develop into the area of the Khvalynsk culture in its latest stages, and possibly later. 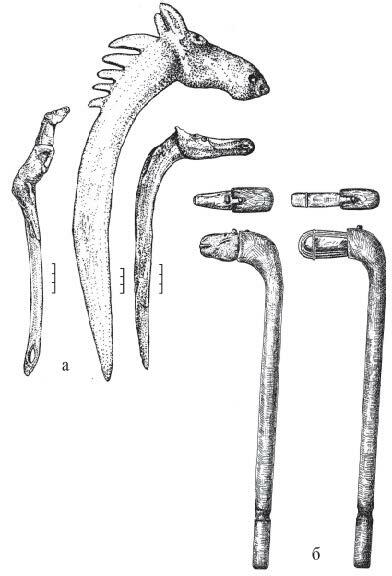 Simultaneously, with the same modifications, these scepters “are introduced” into common usage in the Novodanilovka culture, which in its spread by one wing was in contact and interspersed immediately with the area of Khvalynsk remains; and on the other hand, far in the south – in the Pre-Kuban and Ciscaucasian regions – within the range of the Domaikopska culture; and in the west – in the Carpathian – Post-Kuban – with the areas of early agricultural cultures Cucuteni A – Trypillia B1, Gumelnița-Karanovo VI. 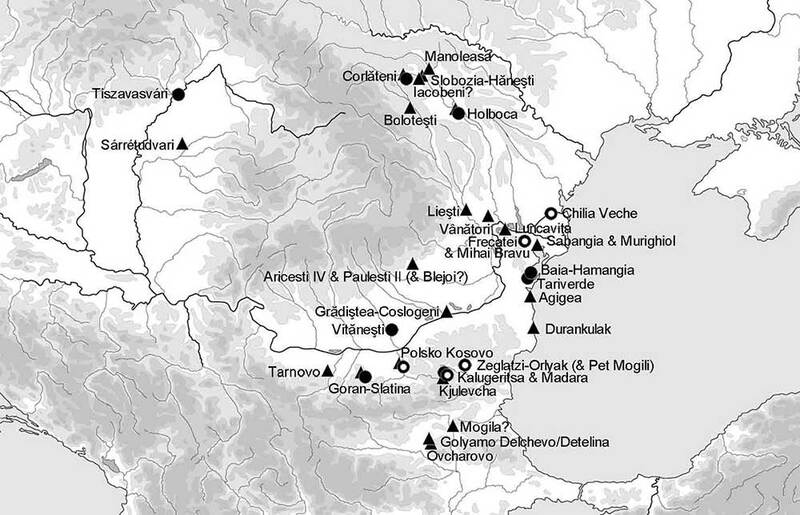 The simultaneous presence in the areas of the Ciscaucasian, Carpatho-Danubian, and especially Novodinilovka cultures, whose carriers continue the Khvalynian traditions of making stone scepters, and the scepters themselves (in their non-functional implication in the local cultural environment), all definitely allow us to view these findings as imported Novodanilovka objects. Schematic depiction of the spread of horse-head scepters in the Middle Eneolithic. See a full version with notes here. The text goes on to make an international comparison of scepters and their relevance as a cultural phenomenon, with its strong symbolic functions as divine object, its use in times of peace, in times of war, and in a system of ritual power. Restoration of V. A. Dergachev: a) model for restoration – Paleolithic and Neolithic wands; b) the expected appearance of the Eneolithic scepter on the handle with a coupling (according to Dergachev 2007). Then among them lord Agamemnon uprose, bearing in his hands the sceptre which Hephaestus had wrought with toil. Hephaestus gave it to king Zeus, son of Cronos, and Zeus gave it to the messenger Argeïphontes; and Hermes, the lord, gave it to Pelops, driver of horses, and Pelops in turn gave it to Atreus, shepherd of the host; and Atreus at his death left it to Thyestes, rich in flocks, and Thyestes again left it to Agamemnon to bear, that so he might be lord of many isles and of all Argos. His studies on horse remains show an interesting, detailed quantitative and statistical approach to the importance and (cultural and chronological) origin of horses (and likely horse domestication) in each culture. Territorial distribution of horse remains in the Middle Eneolithic period. Absolute and relative numbers. Accounting and analysis of archeo-zoological and archaeological data proper for a horse for a vast area from the Tisza and the Middle Danube to the Caucasus and the Urals (which includes the main cultures of the western agricultural, Caucasian, and Eastern European cultural zones) clearly points to the eastern cultural zone as a zone of the originally the most important social significance of a horse as the only possible zone of the earliest domestication, horseback riding and all-round use of a horse. In relation to the eastern, the western land – the ancient Carpatho-Danubian or the Caucasian cultural zones – are secondary and subordinate to the first on the phenomenon under consideration. Horse-shaped hanger-amulets made of bone. 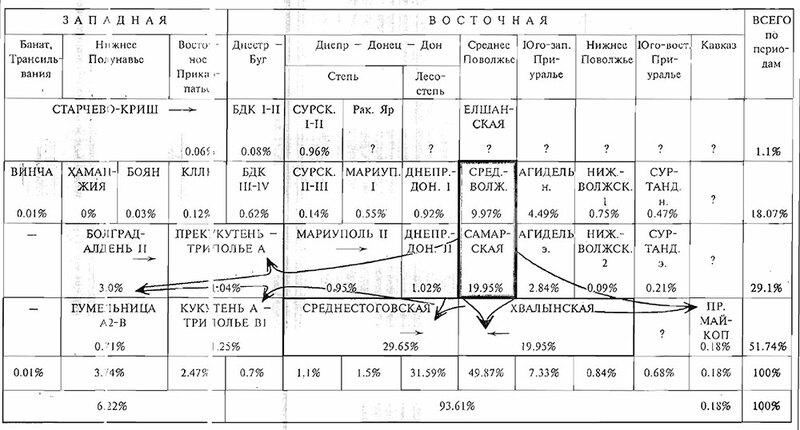 The first quantitative leap in the manifestation of the remnants of a horse, marking itself and the first qualitative changes in the social status of this animal, is due mainly to the Middle Volga culture of the developed Neolithic of the Middle Volga region (in part, the Southwest Urals), which, accordingly, determine the cultural context, time and geographic region – or, the initial, single and main epicenter of the process of taming and domestication of a horse. On the one hand, the subsequent substantial increase in the number of horse remnants, and, on the other, the wide inclusion of the horse in cults, rituals, funerary rituals (horse pendants, ornamented metacarpus, horse bones, sacrificial altars) in the Samara culture of the Early Eneolithic of the same region definitely indicates the continuing increase in the social significance of this species of animal, which was most likely expressed in the final design of a specialized horse breeding culture and, accordingly, in a wide range of applications using a horse for riding. 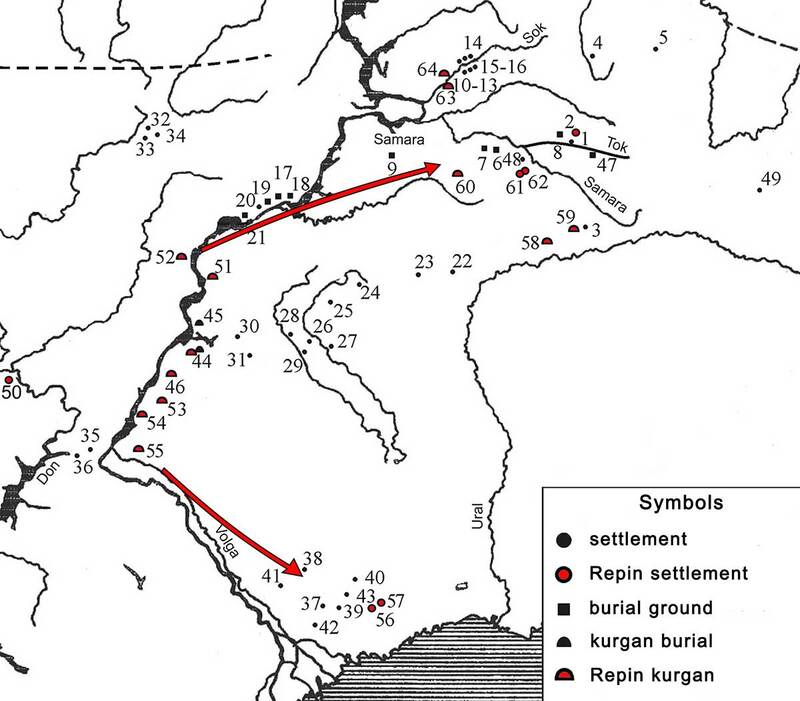 At the same time, we can observe the beginning of the transfer of the already domesticated horse from the original historical and geographic epicenter to other cultures of the eastern cultural zone and, in part, the cultures closest to the periphery of this zone, into the western agricultural zone (Bolgrad-Aldeni P, Pre-CuCuteni-Trypillya A) . Middle Eneolithic – early stages. 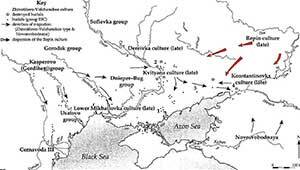 One of the leading places in the remnants of the horse is in the Middle Volga region, the Khvalynsk culture. Genetically related to the Samara, the Khvalynsk I culture preserves the traditions of the ritual, cultural meaning, the treatment of the image of a horse in funerals (altars, horse bones, funerary rituals). But, At the same time, it is in this precise culture that the image of the horse, included in the social symbolism (horse-head pommel-scepter), for the first time it acquires a special, maximum social significance. That is why the appearance and subsequent widespread distribution of the social symbols in Novodanilovka-type objects can definitely be considered as another qualitative leap in the social significance of a horse – its use for military purposes for close and distant expeditions. And such an interpretation is fully confirmed from the analysis of Novodanilovka-type objects, which is the subject of discussion. Judging by the osteological data and the typological evolution of the horse-head scepters, the Khvalynian culture and remains of the Novodanilovka type are already associated with the relatively widespread and intensive findings of domesticated horses in various areas of the eastern cultural zone (semi-desert regions of the Lower Volga and the Caspian region – Khvalynsk culture, forest-steppe and steppe from the Volga to the Dnieper – Sredni Stog, Repin cultures), and the western – agricultural (Gumelnitsa, Cucuteni A-Tripolye Bl), and the Caucasus (Pre-Maykop) zones, where, however, the horse played a very modest role. From the functional point of view, according to the sum of the data, there is no reason to doubt that in the eastern zone the horse is already present in the Late Neolithic period. Since its domestication and the emergence of a specialized horse breeding, it has been also widely used for meat, milk and dairy products (including the traditional hippace tradition of the later Scythians), and since the beginning of the early Eneolithic for transport and for riding purposes. 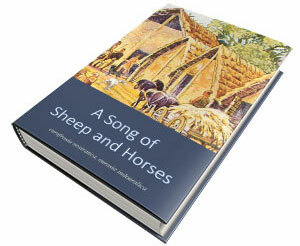 Another thing is the horse as a means of war, a means of distant travel and expansion. The beginning of the use of a horse for these purposes, in the opinion of the author, is determined by the appearance of social symbolism in the form of horse-head scepters, and is most fully reflected in the memories of the Khvalynsk culture and, in particular, the Novodanilovka type. Concerning western or Caucasian cultural zones related to Khvalynsk, the horse is thought to have been linked to the eastern region, used mainly for riding, as a means of transport and for communication, which, however, does not exclude its use for meat. These are the main conclusions-interpretations, suggesting the analysis and archaeological and other sources containing information about the horse. And as for our pommel-scepters, then, as can be seen from these sources, the main thing is that the culture of the Middle Volga region, according to all the data, definitely accumulates in itself the longest traditions associated with the gradual increase of social significance of the horse. And if so, this circumstance motivates the possibility or necessity of appearing in the environment of the bearers of this culture of unique signs-symbols that carry within themselves or reflect the image of this animal as an extremely significant social reality. The revealed and characterized quality, as a matter of fact, fill or open by themselves the hypothetical elements we have previously identified, the meanings of that particularity, folded in the social sign-symbol, in our case – the horse-head-shaped scepter. Archaeological sites with objects (signs-symbols) related to horses. 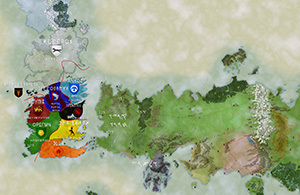 Horse-head scepters included in other maps are excluded from this one (notice the conspicuous absence of such objects in Sredni Stog and neighbouring North Pontic regions). R.J. Harrison & V. Heyd’s paper on the origin of the expanding East Bell Beaker folk The Transformation of Europe in the Third Millennium BC: The Example of ‘Le Petit Chasseur I+III’ (Sion, Valais, Switzerland). Praehistorische Zeitschrift 82/2, 2007, p. 129-214. 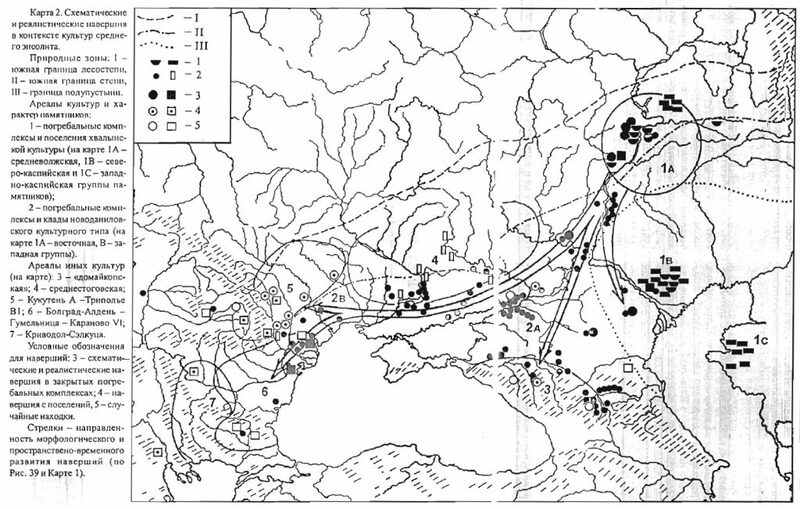 D. W. Anthony’s comprehensive revision of Gimbutas’ Kurgan model (especially on the nature and expansion of Khvalynsk/Repin, the precise origin of horseback riding, and the nature and expansion of Sintashta/Andronovo) The Horse, the Wheel, and Language: How Bronze-Age Riders from the Eurasian Steppes Shaped the Modern World, Princeton University Press, 2007. 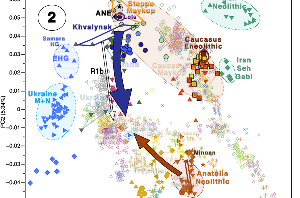 Each one of these works taken independently (especially the books) may give a different version of Proto-Indo-European migrations; Anthony and Dergachev are heirs of Gimbutas’ simplistic kurgan-based model, and of other previous, now rejected ideas, and they reflect them whenever they don’t deal with first-hand investigation (and even sometimes when interpreting their own data). 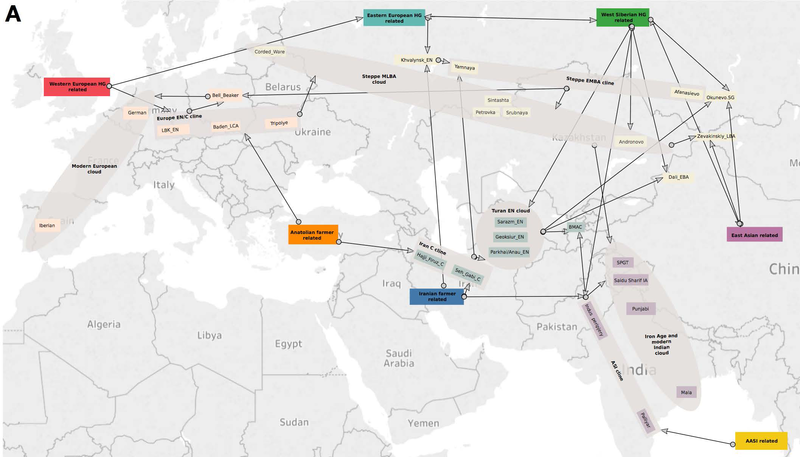 Taken together – and especially in combination with recent genetic studies – , though, they describe a clearer, solider model of how Proto-Indo-Europeans developed and expanded. 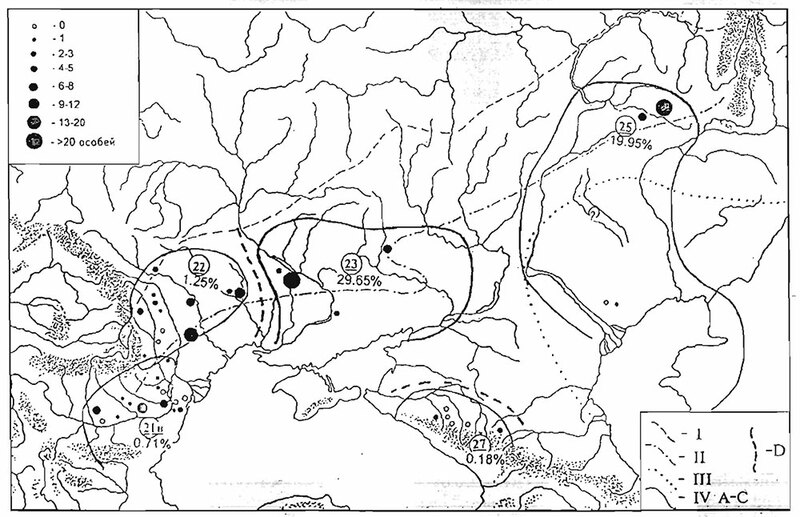 Distribution of horse-head scepters, according to Dergachev, Sorokin (1986). Anthony’s publication overshadowed the importance of Dergachev’s work for the English-speaking world – and by extension for the rest of us. 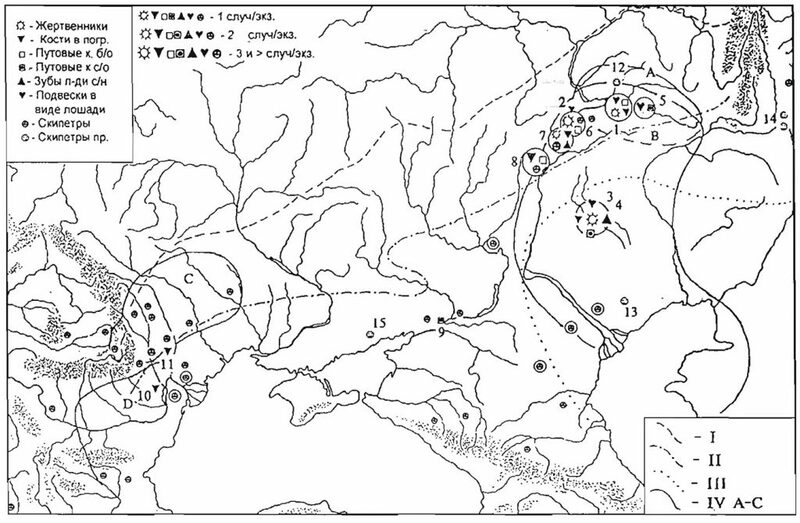 However, V. A. Dergachev’s updated study of his previous work on steppe cultures shows the right, thorough, and diligent way of describing the expansion of early Khvalynsk-Novodanilovka chieftains with the horse and horse symbolism into the Caucasus and the Lower Danube (like the seminal work of Harrison & Heyd 2007 described the expansion of Yamna settlers with East Bell Beakers, culturally opposed to Corded Ware and to the Proto-Beakers). On the other hand, Anthony’s broad-brush, superficial description of thousands of years of potential Indo-European-speaking peoples gave a migration picture that – although generally right (like radiocarbon-based Iberian origin of the Bell Beaker culture was right) – was bound to be wrong in some essential details, as we are seeing in archaeology and genetics. NOTE. As I have said before, Anthony’s interpretations of Sredni Stog culture representing a sort of ‘peasants’ under the rule of Novodanilovka chiefs was based on old theories of Telegin, who changed his mind – as did the rest of the Russian school well before the publication of Dergachev’s book, considering both as distinct cultural phenomena. Anthony selected the old interpretation, not to follow a Gimbutas / Kristiansen model of Sredni Stog being Indo-European and expanding with GAC into Corded Ware (because, for him, Corded Ware peoples were originally non-Indo-European speakers): he seems to have done it to prove that Proto-Anatolian traveled indeed through the North Pontic area, i.e. to avoid the regional ‘gap’ in the maps, if you like. Then with the expansion of Repin over the area, Sredni Stog peoples would have been absorbed. With genetic investigation, as we know, and with this kind of detailed archaeological studies, the traditional preference for “large and early” IE territories – proper of the mid-20th century – are no longer necessary. We already had in 2016 a Samara hunter-gatherer sample dated ca. 5600 BC, representative of EHG ancestry, of haplogroup R1b1a. We also had three early Khvalynsk samples from Samara Eneolithic dated ca. 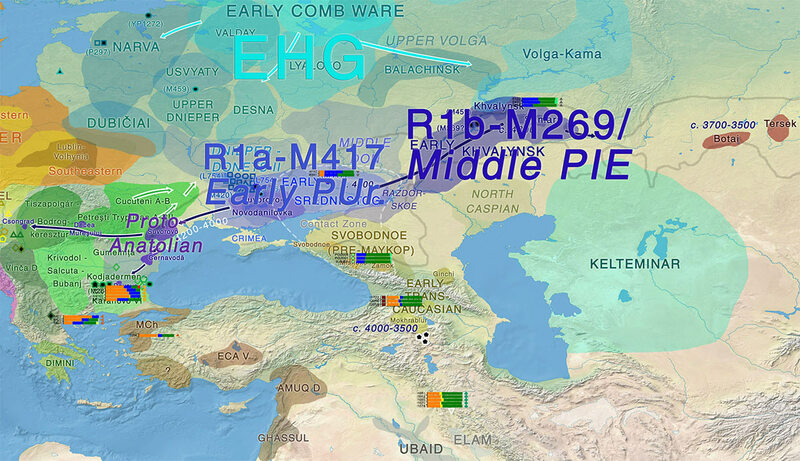 4600 BC, with a drift towards (what we believe now is) a population from the Caucasus, showing haplogroups Q1a, R1a1(xM198), and R1b1a, the last one described in its paper as from a high-status burial, similar to high-status individuals buried under kurgans in later Yamna graves (of R1b-L23 lineages), and therefore likely a founder of an elite group of patrilineally-related families, while the R1a1 sample showed scarce decoration, and does not belong to the M417 lineage expanded later in Sredni Stog or Corded Ware. 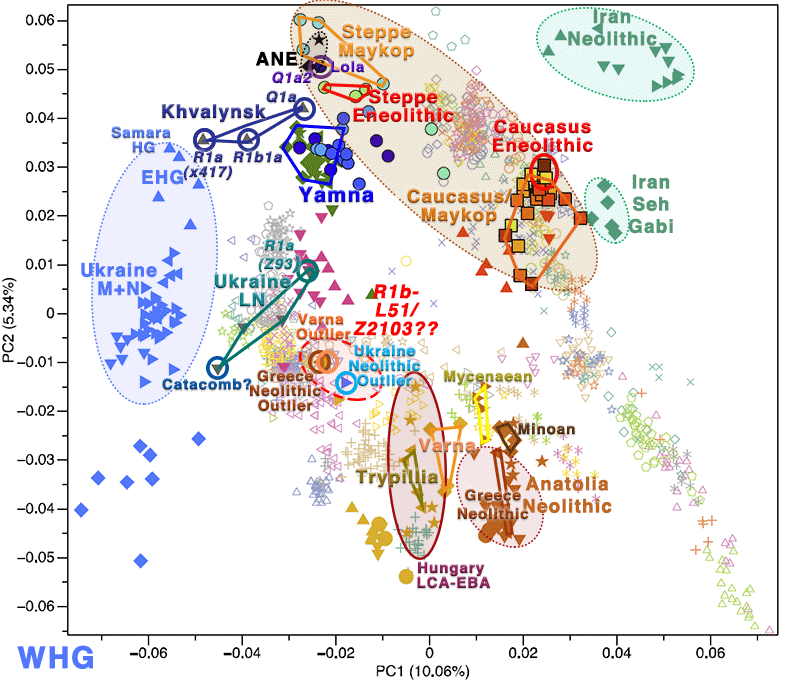 In 2017 we knew of the Ukraine_Eneolithic sample I6561, from Alexandria, of a precise subclade (L657) of haplogroup R1a-Z93, dated ca. 4000 BC, and likely from the Sredni Stog (or maybe Kvitjana) culture. 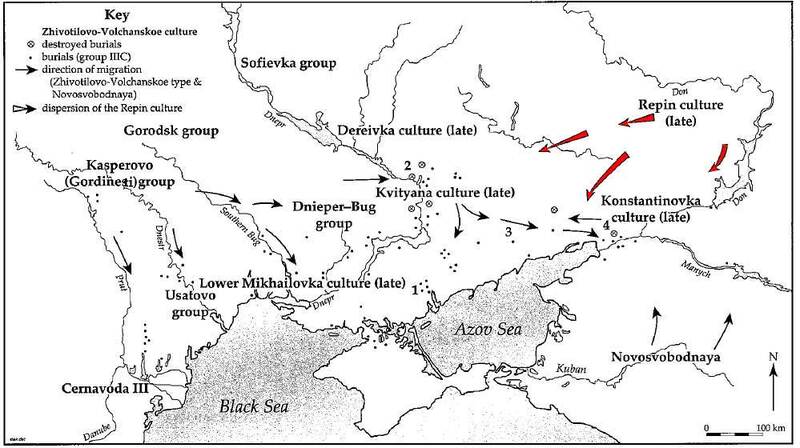 This sample alone makes it quite likely that the expansion of R1a-Z645 subclades happened earlier than expected, and that it was associated with movements along forest-steppe cultures, most likely along the Upper Dniester or Dnieper-Dniester corridor up to the Forest Zone. 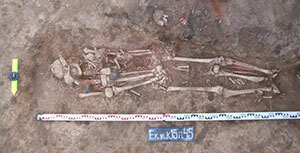 We have now confirmation that Khvalynsk samples from the Yekaterinovka Cape settlement ca. 4250-4000 BC were reported by a genetic lab (to the archaeological team responsible) as being of R1b-L23 subclades, although the precise clades (reported as P312 and U106) are possibly not accurate. NOTE. Curiously enough, and quite revealing for the close relationship of scepters to the ritual source of power for Khvalynsk chieftains (political and/or religious leaders), the scepter found in the elite burial 45 of the Ekaterinovka cape (a riverine settlement) shows a unique zoomorphic carving, possibly resembling a toothed fish or reptile, rather than the most common horse-related motifs of the time. Zoomorphic carved stone scepter of the Ekaterinovka Cape burial 45: photos (left) and schematic depiction (right). 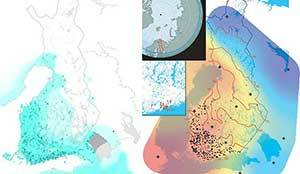 The two distinct clusters are already visible in the oldest individuals of our temporal transect, dated to the Eneolithic period (~6300-6100 yBP/4300-4100 calBCE). 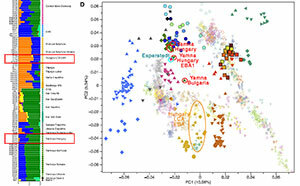 Three individuals from the sites of Progress 2 and Vonjuchka 1 in the North Caucasus piedmont steppe (‘Eneolithic steppe’), which harbor Eastern and Caucasian hunter-gatherer related ancestry (EHG and CHG, respectively), are genetically very similar to Eneolithic individuals from Khalynsk II and the Samara region19, 27. This extends the cline of dilution of EHG ancestry via CHG/Iranian-like ancestry to sites immediately north of the Caucasus foothills. 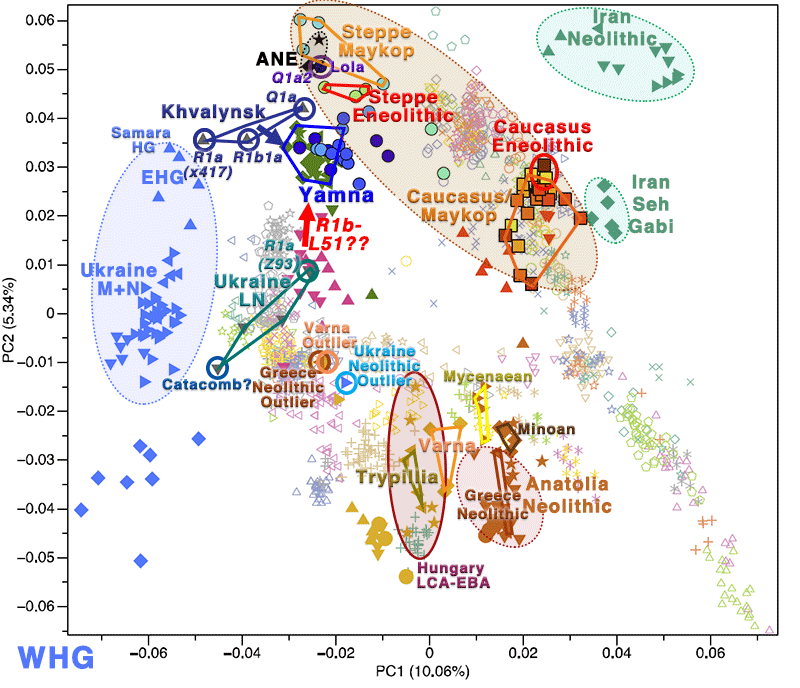 In contrast, the oldest individuals from the northern mountain flank itself, which are three first degree-related individuals from the Unakozovskaya cave associated with the Darkveti-Meshoko Eneolithic culture (analysis label ‘Eneolithic Caucasus’) show mixed ancestry mostly derived from sources related to the Anatolian Neolithic (orange) and CHG/Iran Neolithic (green) in the ADMIXTURE plot (Fig. 2C). 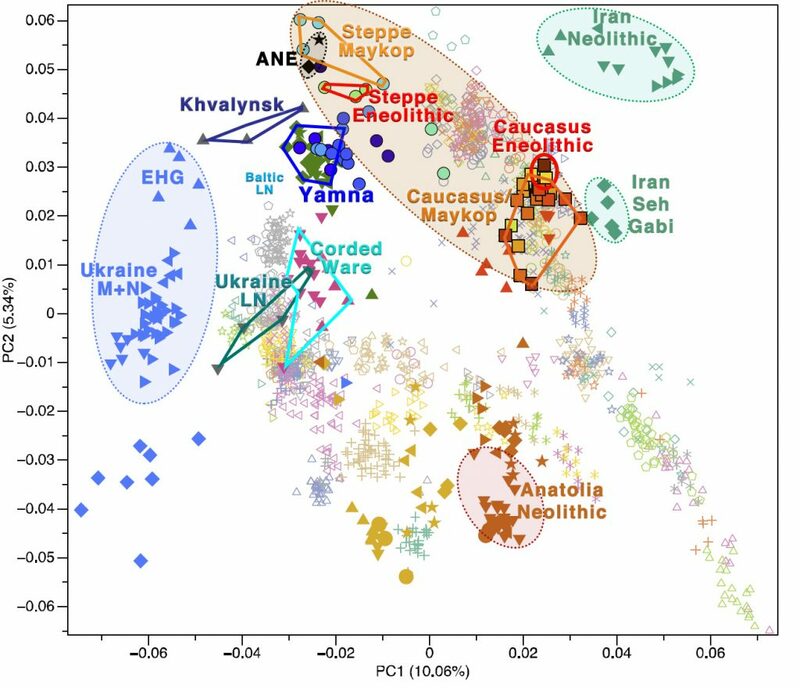 While similar ancestry profiles have been reported for Anatolian and Armenian Chalcolithic and Bronze Age individuals20, 23, this result suggests the presence of the mixed Anatolian/Iranian/CHG related ancestry north of the Great Caucasus Range as early as ~6500 years ago. 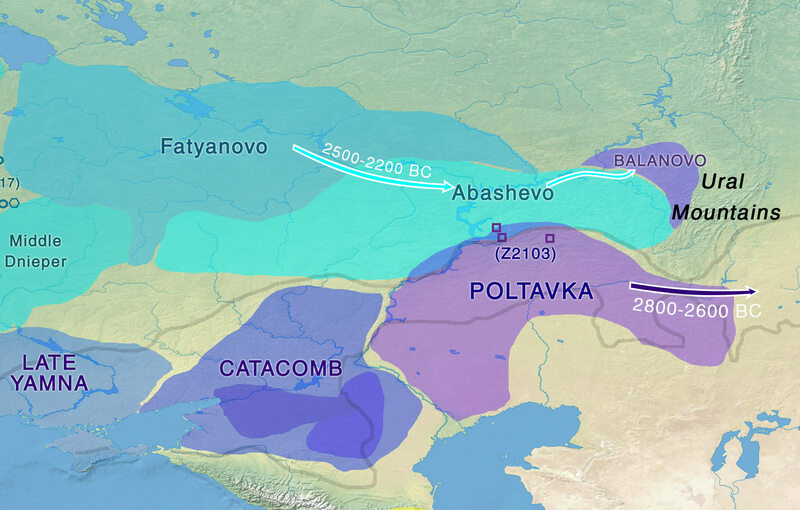 During the late 5th millennium BC, cultural groups of the Eneolithic occupied the northern circumpontic area and the areas between the North Caucasus and the Lower Volga. For the first time, individual inhumations were placed below low burial mounds (Rassamakin, 2011). During the 4th millennium BC, the area split into two cultural spheres. In the northern steppe area communities continued with the burial practice of crouched inhumations below low mounds, with this culturally transforming into the early Pit Grave culture. 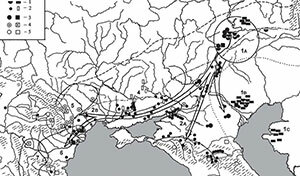 In contrast, in the Caucasian foothill zone and the neighbouring steppe, the Majkop-Novosvobodnaya culture emerged (Kohl and Trifonov, 2014). Similarly, during the 3rd millennium BC, two cultural spheres influenced the area: The North Caucasian Culture dominated the Caucasian foothills for the next five centuries, while in the steppe area between the Lower Don and the Caucasus, regional groups of the Catacomb Culture existed side-by-side. The oldest group of individuals with trepanations are found in the North Caucasian variant of the late circumpontic Eneolithic and date to the last third of the 5th millennium BC (Korenevsky, 2012). Burials of this epoch are inhumations in shallow pits, chiefly without burial goods, but covered with large quantities of red ochre. Of special interest is a collective burial of seven individuals from VP 1/12, who were interred together in a secondary burial ritual. 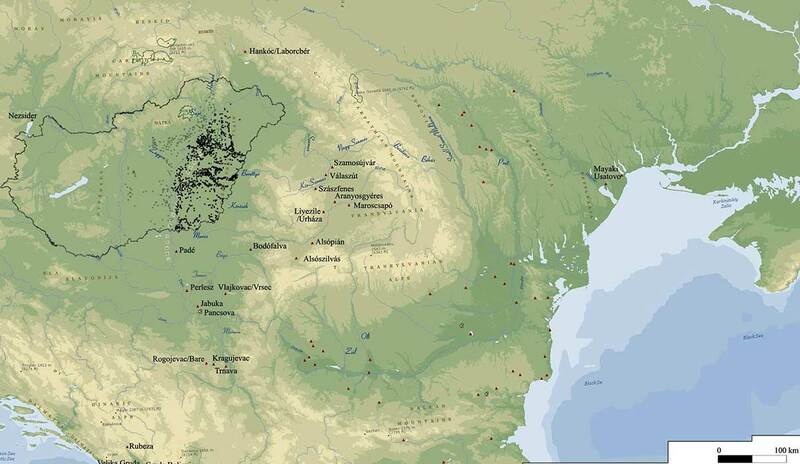 The sites of Tuzluki, Mukhin, Voinuchka, Progress, and Sengileevskii all belong to this period. Without the datasets to test different models, you can only imagine what is happening with the processed, secondary data we have. The position of Eneolithic Steppe cluster in the PCA (probably Khvalynsk-related peoples already influenced by the absorbed, previous Caucasus population), as well as other potential Caucasus groups intermediate between Steppe Maykop and Caucasus Maykop (as suggested by other ancient and modern Caucasus samples), may indicate that Yamna is between Khvalynsk and such intermediate Caucasus populations (as the source of the additional CHG-related ancestry) and – as the paper itself states – that it also received additional EEF contribution, probably from the western cultures absorbed during these Khvalynsk-Novodanilovka migrations (or later during Khvalynsk/Repin migrations). 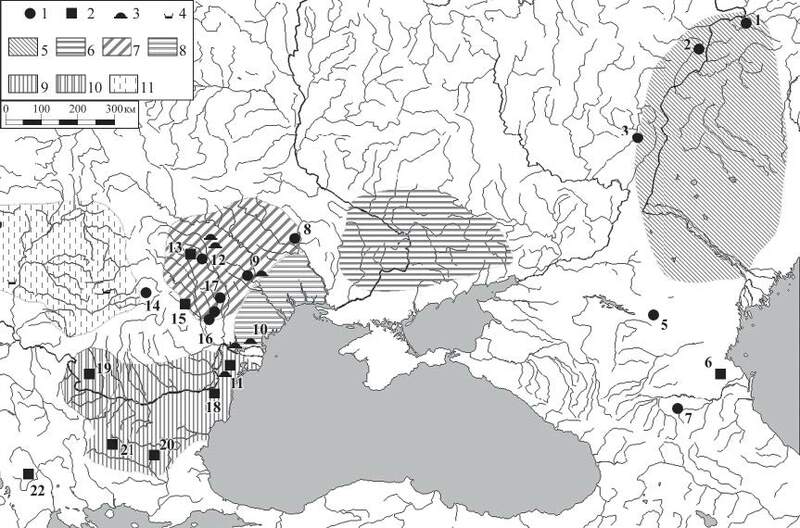 Also interpreted in light of these early Khvalynsk-Novodanilovka migrations of horse riding chieftains (and their close contacts with the Caucasus), you can clearly see where the similar CHG-like contribution to Ukraine Eneolithic and other North Pontic forest-steppe cultures (which later contributed to Proto-Corded Ware peoples) must have come from. The simplistically reported proportions of EHG:CHG:EEF ancestry might be similar in many of these groups, but the precise origin and evolution of such ancestral components is certainly not the same: statistical methods will eventually show this, when (and if) we have many more samples, but for the moment Y-DNA is the most obvious indicator of such differences. There was no steppe people speaking a steppe language™ AKA immutable Proto-Indo-European: the glottochronological models spanning thousands of years are not valid for the steppe, just as they are not valid for an Anatolian homeland, nor for a Caucasus homeland. The actual cultural-historical early Sredni Stog – Khvalynsk community, formed earlier than ca. 5000 BC, is a thousand years older than the expansion of Khvalynsk with the horse, and some two thousand years older than the expansion of Khvalynsk-Repin/Early Yamna migrants (see here for the latest genetic research). 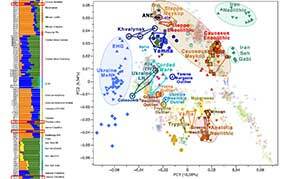 What lies between the formation of that early Eneolithic cultural-historical community, and what we see in archaeology and genetics in Middle and Late Eneolithic steppe cultures, is the radical differentiation of western (Ukraine Eneolithic, mainly forest-steppe) and eastern (Samara and Khvalynsk/Repin, mainly steppe) cultures and peoples, i.e. precisely the period of differentiation of an eastern, Proto-Indo-Hittite-speaking early Khvalynsk community (that expanded with the horse and horse-related symbols) from a western, probably Early Proto-Uralic speaking community of the North Pontic forest-steppe cultural area. NOTE. I am not against a Neolithic ‘steppe’ language. But this steppe language was spoken before and/or during the first Neolithisation wave, and should be associated with Indo-Uralic. 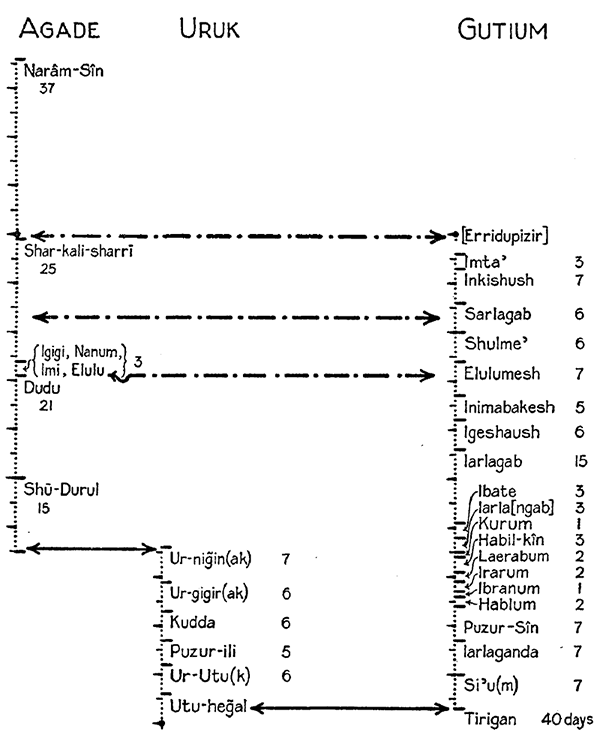 If there was no Indo-Uralic language, then some communities would have developed Early Proto-Indo-European and Early Proto-Uralic side by side, in close contact to allow for dozens of loanwords or wanderwords to be dated to this period (where, simplistically, PIH *H corresponds to EPU *k, with some exceptions). Map of a) steppe – forest-steppe border during the Eneolithic in the Pontic-Caspian region and b) the border today, showing a more limited steppe zone in the North Pontic area (reason for the specific ways of expansion of horse-related cultures and horse-related nomadic pastoralism during the Eneolithic). The convergence that we see in PCA and Admixture of Yamna and the earliest Baltic LN / Corded Ware ‘outlier’ samples (if not directly related exogamy of some Baltic LN/CWC groups with Yamna migrants, e.g. 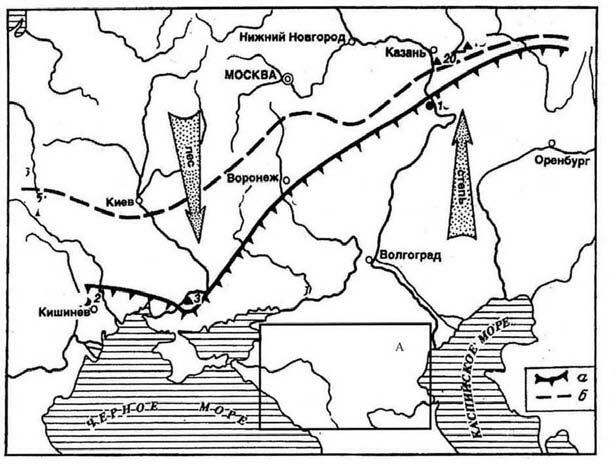 those along the Prut), must be traced back to the period of genetic drift that began precisely with these Khvalynsk-Novodanilovka expansions, also closely associated with populations of the Caucasus, thus bringing North Pontic forest-steppe cultures (probably behind Proto-Corded Ware peoples) nearer to Khvalynsk, and both by extension to Yamna. We have seen this problem arise in Bell Beaker samples expanding all over Europe, turning from a fully Yamnaya-like population to something else entirely in different regions, from more EEF-like to more CWC-like, sharing one common trait: Y-DNA. 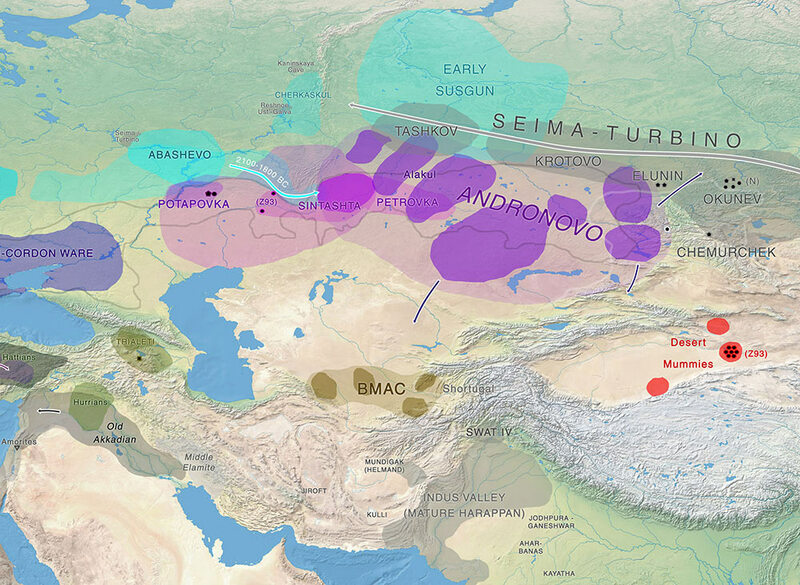 We are seeing the same happen with Balkan groups and Mycenaeans, with Old Hittites, and with steppe MLBA from Andronovo peoples expanding over Central and South Asia, and we know that patrilineal clans and thus Y-chromosome bottlenecks were common after Neolithisation, especially with nomadic pastoralist steppe clans (and probably also with many previous population expansions). 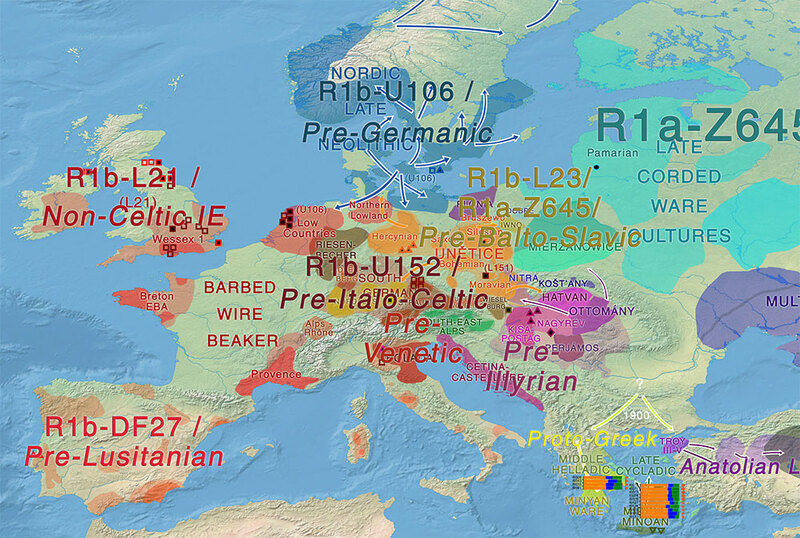 Steppe Eneolithic peoples were thus no different to other previous and posterior expanding groups, and ancestry is going to be similar for people living in neighbouring regions, so Y-DNA will remain the essential tool to distinguish different peoples (see here a summary of Proto-Indo-Europeans expanding R1b-L23). We are nevertheless still seeing “R1b zombies” (a quite appropriate name I read on Anthrogenica) still arguing for a Western European origin of R1b-L23 based on EEF-like ancestry and few steppe-related contribution found in Iberian Bell Beakers (read what David Reich has to say on this question); and “OIT zombies” still arguing for IVC representing Proto-Indo-European, based on Iran_N ancestry and the minimal steppe ancestry-related impact on certain ancient Asian cultures, now partly helped by “Caucasus homeland zombies” with the new PIE=CHG model; apart from many other pet theory zombies rising occasionally from their graves here and there. 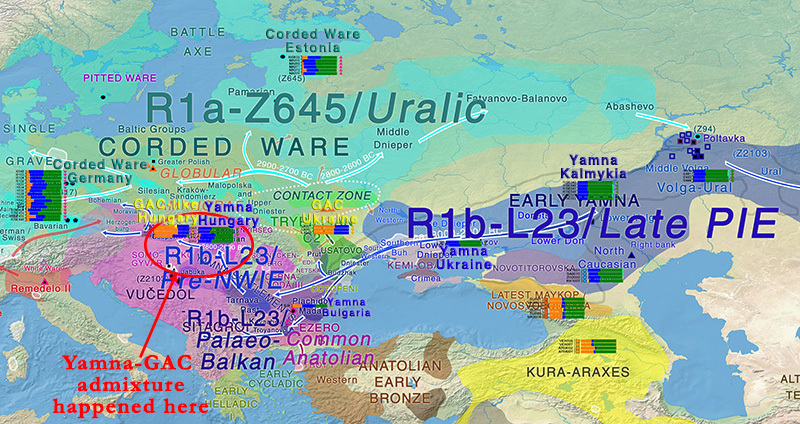 Let’s hope that this virus of the undead theories does not spread too strongly to the R1a-Indo-European association, when the official data on Khvalynsk, West Yamna, and Yamna Hungary come out and show that they were dominated by R1b-L23 lineages. 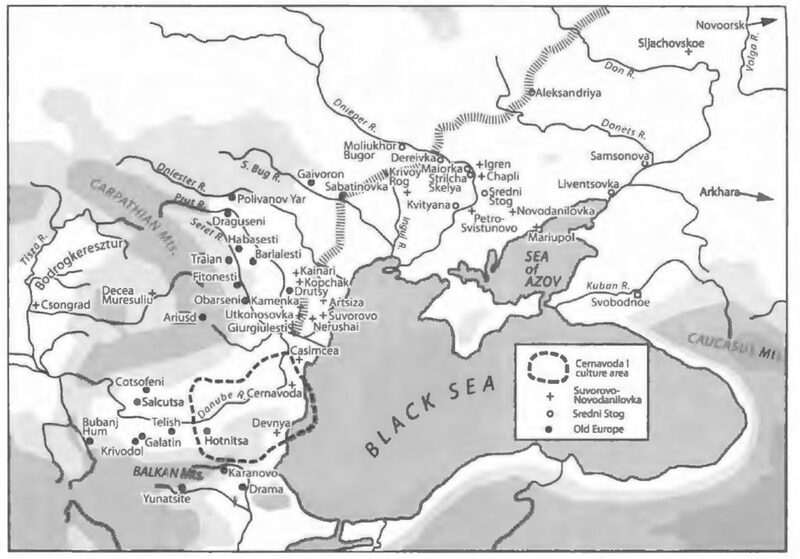 Because we need to explore in detail the continuation of Khvalynsk-related (potential Proto-Anatolian) cultures in the Lower Danube and the Balkans, e.g. 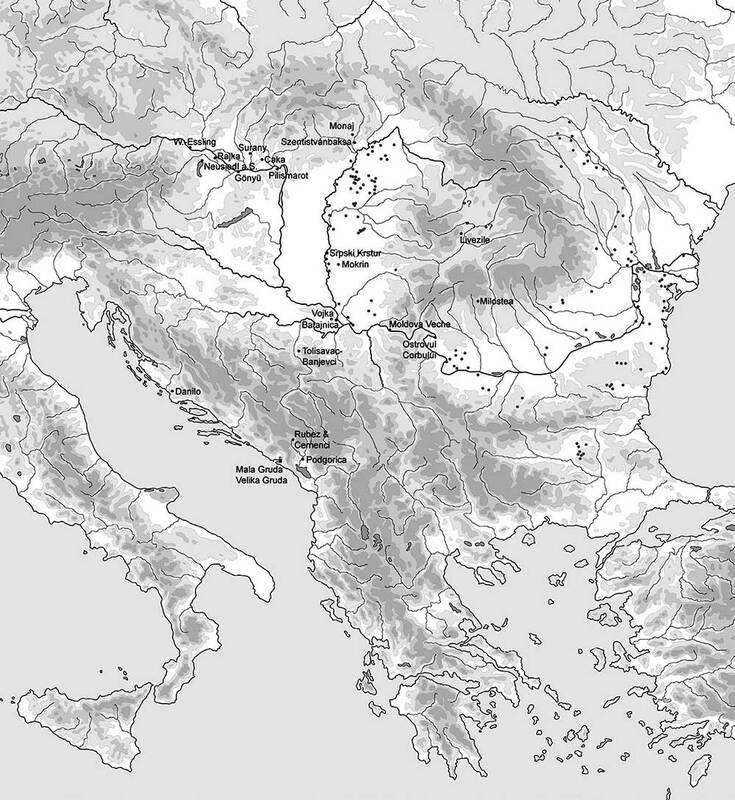 from Cernavoda I to Cernavoda III, then maybe to Ezero, and then to Troy; as well as the specific areas of Late Indo-European expansions associated with Early Yamna settlers turning into Bell Beakers, Balkan EBA, and Steppe MLBA-associated cultures. 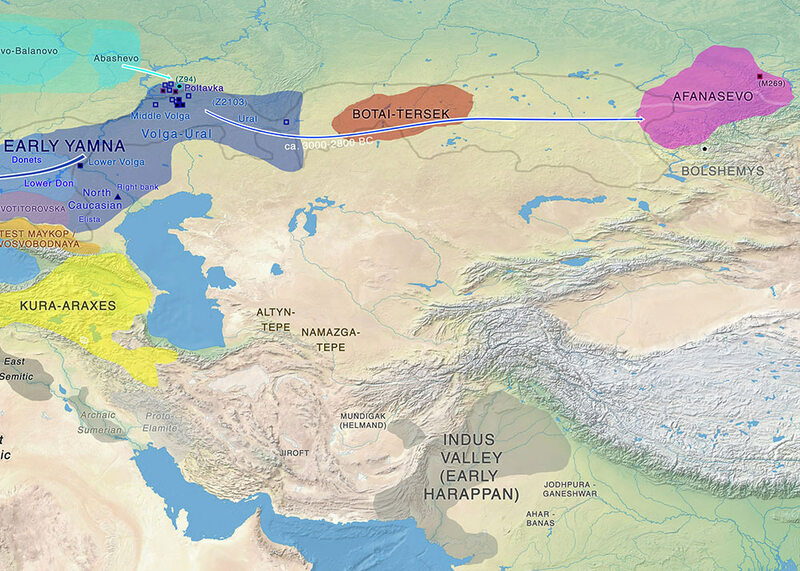 There is a lot of work to do on proper definition of Bronze Age cultures and their potential dialects, as well as convergence and divergence trends, and not only of Indo-European, but also of Uralic-speaking communities derived from Corded Ware cultures. If we let the narratives of the 2000s in Genetics (in combination with the 1960s in Archaeology) dominate the conversation, then a lot of time will be absurdly lost until reality imposes itself. And it will. EDIT (2 JUL 2018): Some sentences corrected, and some information added to the original post. A commenter, Old Europe, drew my attention to the Uralic (Finnic-Saamic) substrate in Germanic proposed by Schrijver in Chapter V. Origins of Language Contact and the Origins of the Germanic Languages, Routledge (2014). NOTE. I have avoided many detailed linguistic discussions. You should read the whole chapter to check them out. Linguistically, the relationship between Indo-European and Uralic has always been asymmetrical. While hundreds of loanwords flowed into Uralic languages from Indo-European languages such as Germanic, Balto-Slavic, Iranian, and Proto-Indo-European itself, hardly any Uralic loanwords have entered the Indo-European languages (apart from a few relatively late dialectal loans into e.g. Russian and the Scandinavian languages). This strongly suggests that Uralic speakers have always been more receptive to ideas coming from Indo-European–speaking areas than the other way around. 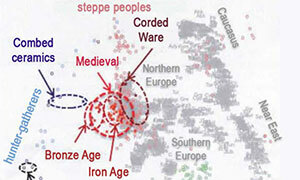 This inequality probably began when farming and the entire way of life that accompanies it reached Uralic-speaking territory via Indo-European–speaking territory, so that Uralic speakers, who traditionally were hunter-gatherers of the mixed and evergreen forest zone of northeastern Europe and gradually switched to an existence as sedentary farmers, were more likely to pick up ideas and the words that go with them from Indo-European than from anywhere else. All of this is no doubt a simplification of the thousands of years of associations between speakers of Uralic and speakers of Indo-European, but the loanword evidence strongly suggests that by and large relations between the two groups were highly unequal. The single direction in which loanwords flowed, and the mass of loanwords involved, can be compared with the relation between Latin and the vernacular languages in the Roman Empire, almost all of which disappeared in favour of Latin. It is therefore certain that groups of Uralic speakers switched to Indo-European. The question is whether we can trace those groups and, more particularly, whether Finnic speakers switching to Indo-European were involved in creating the Indo-European dialect we now know as Germanic. What both have in common is that the sound structures of Finnic and Germanic, which started from very different beginnings, apparently came to resemble one another significantly. If that is what we observe, we must conclude that both languages converged as a result of contact. During the approximately five to six millennia that separate Proto-Uralic from Modern Finnish, there was only one episode during which the consonantal system underwent a dramatic overhaul. This episode separates the Finno-Saamic protolanguage, which is phonologically extremely conservative, from the Balto-Finnic protolanguage, which is very innovative. 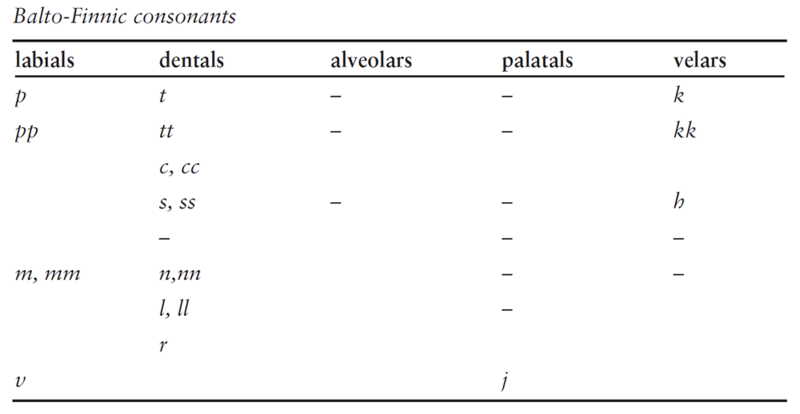 Both languages lost the palatalized series of consonants (apart from j), which in both languages became non-palatalized. Both languages developed an extensive set of long (geminate) consonants; Pre-Germanic had none, while Finno-Saamic already had a few. Both languages developed an h.
These similarities between the languages are considerable. The idea that perhaps both languages moved towards a lost third language, whose speakers may have been assimilated to both Balto-Finnic and Germanic, provides a fuller explanation but suffers from the drawback that it shifts the full burden of the explanation to a mysterious ‘language X’ that is called upon only in order to explain the developments in Proto-Germanic and Balto-Finnic. 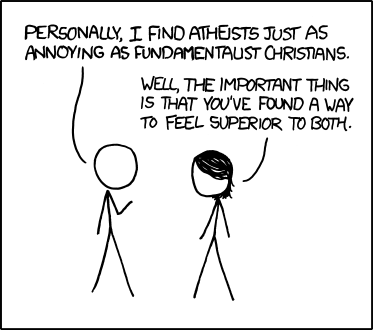 That comes dangerously close to circular reasoning. We can therefore repeat for Proto-Uralic the argument that persuaded us earlier that gradation in Saami and Balto-Finnic must go back to the common Finno-Saamic protolanguage: the similarity of the gradation rules in Nganasan to those in Finno-Saamic is so specific and so detailed, and the phenomenon of gradation so rare in the languages of the world, that gradation must be reconstructed for the Uralic protolanguage. Verner’s law turns all voiceless obstruents (Pre-Germanic *p, t, k, kj, kw, s) into voiced obstruents (ultimately Proto-Germanic *b/v , d/ð, g/γ, g/γ, gw, z) after a Pre-Germanic unstressed syllable. Rhythmic gradation turns all voiceless obstruents after an unstressed syllable into weak-grade consonants, which means that *p, t, k, s become Finnic *b/v , d/ð , g/γ, z. This is striking. Given the geographical proximity of Balto-Finnic and Germanic and given the rare occurrence of stress-related consonant changes in European languages, it would be unreasonable to think that Verner’s law and rhythmic gradation have nothing to do with one another. It is very hard to accept, however, that gradation is the result of copying Verner’s law into Finnic. First of all, Verner’s law, which might account for rhythmic gradation, in no way accounts for syllabic gradation in Finnic. 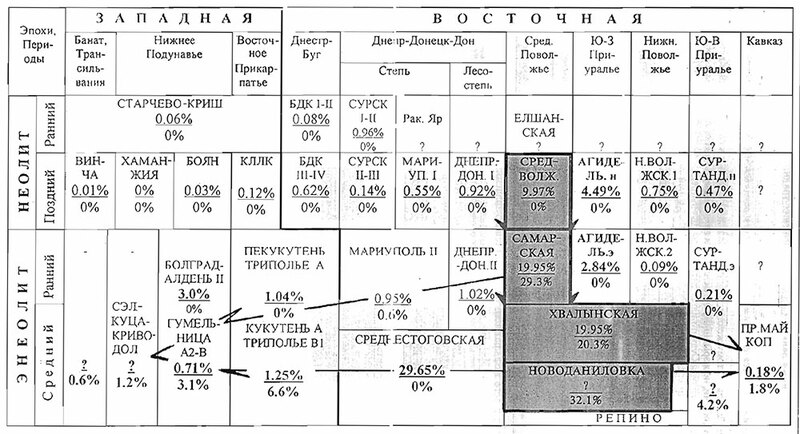 And, second, gradation can be shown to be an inherited feature of Finnic which goes all the way back to Proto-Uralic. Once one acknowledges that Verner’s law and gradation are causally linked and that gradation cannot be explained as a result of copying Verner’s law into Finnic, there remains only one possibility: Verner’s law is a copy of Finnic rhythmic gradation into Germanic. That means that we have finally managed to find what we were looking for all along: a Finnic sound feature in Germanic that betrays that Finnic speakers shifted to Germanic and spoke Germanic with a Finnic accent. The consequence of this idea is dramatic: since Verner’s law affected all of Germanic, all of Germanic has a Finnic accent. On the basis of this evidence for Finnic speakers shifting to Germanic, it is possible to ascribe other, less specifically Finnic traits in Germanic to the same source. The most obvious trait is the fixation of the main stress on the initial syllable of the word. Initial stress is inherited in Finno-Saamic but was adopted in Germanic only after the operation of Verner’s law, quite probably under Finnic influence. The consonantal changes described in section V.3.1 can be attributed to Finnic with less confidence. 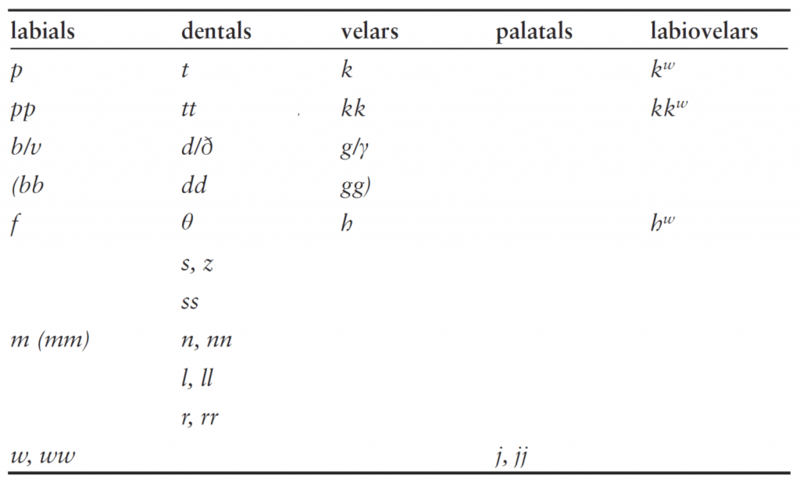 The best case can be made for the development of geminate (double) consonants in Germanic, which did not inherit any of them, while Finno-Saamic inherited *pp, tt, kk, cc and took their presence as a cue to develop other geminates such as *nn and *ll . Possibly geminates developed so easily in Proto-Germanic because Finnic speakers (who switched to Germanic) were familiar with them. Other consonantal changes, such as the loss of the palatalized series in both Germanic and Balto-Finnic and the elimination of the different s- and c-phonemes, might have occurred for the same reason: if Balto-Finnic had undergone them earlier than Germanic, which we do not know, they could have constituted part of the Balto-Finnic accent in Germanic. An alternative take on those changes starts from the observation that they all constitute simplifications of an older, richer system of consonants. While simplifications can be and often are caused by language shift if the new speakers lacked certain phonemes in their original language, simplifications do not require an explanation by shift: languages are capable of simplifying a complex system all by themselves. Yet the similarities between the simplifications in Germanic and in Balto-Finnic are so obvious that one would not want to ascribe their co-occurrence to accidental circumstances. Voiceless lenis pronunciation of b, d, g is typical of the majority of German and Scandinavian dialects, so may well have been inherited from Proto-Germanic. Voiceless lenis is also the pronunciation that has been assumed to underlie the weak grades of Finno-Saamic single *p, t, k. If Proto-Germanic *b, d, g were indeed voiceless lenis, the single most striking result of the Germanic consonant shift is that it eliminated the phonological difference between voiced and voiceless consonants that Germanic had inherited from Proto-Indo-European (…) Since neither Finno-Saamic nor Balto-Finnic possessed a phonological difference between voiced and voiceless obstruents, its loss in Proto-Germanic can be regarded as yet another example of a Finnic feature in Germanic. It is clear that this account of the first Germanic consonant shift as yet another example of Finnic influence is to some degree speculative. The point I am making is not that the Germanic consonant shift must be explained on the basis of Finnic influence, like Verner’s law and word-initial stress, only that it can be explained in this way, just like other features of the Germanic sound system discussed earlier, such as the loss of palatalized consonants and the rise of geminates. A consequence of this account of the origins of the Proto-Germanic consonantal system is that the transition from Pre-Germanic to Proto-Germanic was entirely directed by Finnic. Or, to put it in less subtle words: Indo-European consonants became Germanic consonants when they were pronounced by Finnic speakers. The vocalic system, on the other hand, presented less difficulties for both, Indo-European and Uralic speakers, since it was quite similar. Schrijver goes on to postulate certain asymmetric differences in loans, especially with regard to Proto-Germanic, Balto-Finnic, Proto-Saamic, Proto-Baltic, and later contacts, including a potential non-Uralic, non-IE substrate language to justify some of these, which may in turn be connected with Kroonen’s agricultural substrate hypothesis of Proto-Germanic, and thus also with the other surviving Scandinavian Neolithic cultures before the eventual simplification of the cultural landscape during the Bronze Age. The Finnic-Germanic contact situation has turned out to be of a canonical type. To Finnic speakers, people who spoke prehistoric Germanic and its ancestor, Pre-Germanic, must have been role models. Why they were remains unclear. In the best traditions of Uralic–Indo-European contacts, Finnic speakers adopted masses of loanwords from (Pre-)Germanic. Some Finnic speakers even went a crucial step further and became bilingual: they spoke Pre-Germanic according to the possibilities offered by the Finnic sound system, which meant they spoke with a strong accent. The accent expressed itself as radical changes in the Pre-Germanic consonantal system and no changes in the Pre-Germanic vowel system. This speech variety became very successful and turned an Indo-European dialect into what we now know as Germanic. Bilingual speakers became monolingual speakers of Germanic. What we do not know is for how long Finnic-Germanic bilingualism persisted. It is possible that it lasted for some time because both partners grew more alike even with respect to features whose origin we cannot assign to either of them (loss of palatalized consonants): this suggests, perhaps, that both languages became more similar because generally they were housed in the same brain. What we can say with more confidence is that the bilingual situation ultimately favoured Germanic over Finnic: loanwords continued to flow in one direction only, from Germanic to Finnic, hence it is clear that Germanic speakers remained role models. This is as far as the linguistic evidence can take us for the moment. 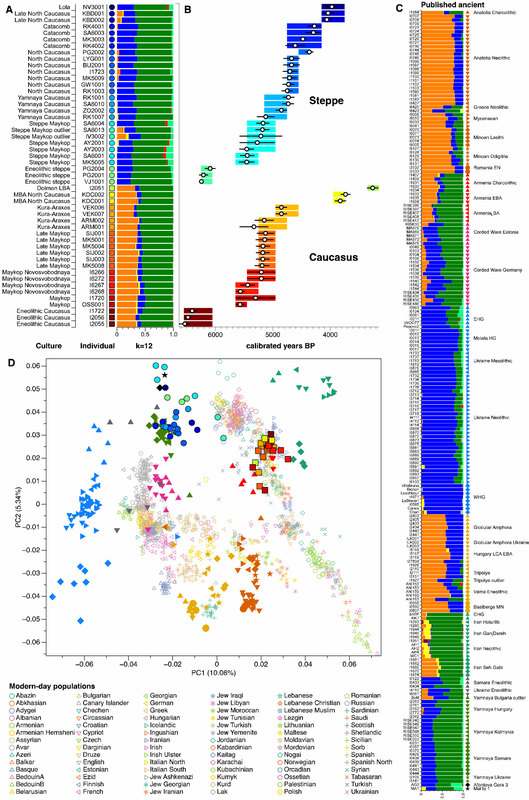 Based on archaeology and genetics, I think we can say that the close North-West Indo-European – Proto-Finnic interaction in Scandinavia lasted for hundreds of years, during the time when a unifying Nordic culture and language developed from Bell Beaker maritime elites dominating over Corded Ware groups. 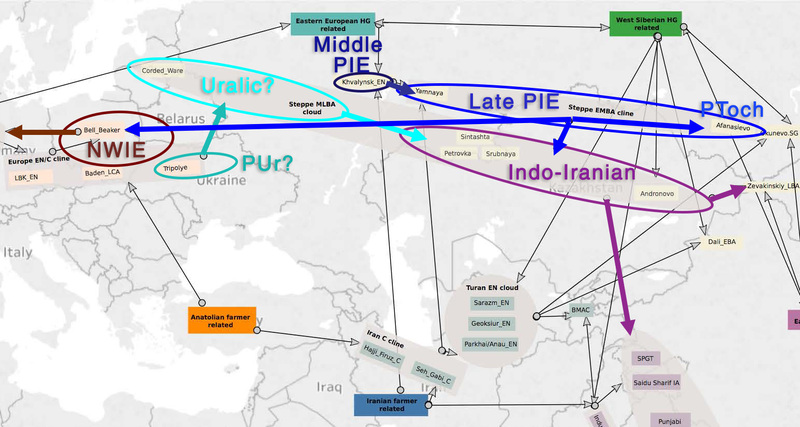 As we know, Uralic languages were in close contact with Middle PIE, and also later with Proto-Indo-Iranian. This Pre-Germanic development in Scandinavia is therefore another hint at the identification of a rather early Proto-Finnic spoken in the Baltic area – potentially then by Battle Axe groups – , and thus the general identification of Uralic expansion with the different Corded Ware groups. NOTE. The ‘common’ loss of certain palatals, which Schrijver interprets as a change of Pre-Germanic from the inherited Proto-Indo-European, may in fact not be such – in the opinion of bitectalists, including us, and especially taking the North-West Indo-European reconstruction and the Corded Ware substrate hypothesis into account – , so this effect would be a rather unidirectional shift from Finnic to Germanic. On the other hand, certain palatalization trends which some have described for Germanic could in fact be explained precisely by this bidirectional influence.